lizzy write: we're coming for you, seattle! we're coming for you, seattle! Big news for the Bryant family! We are moving to Seattle! You guys, I can't begin to explain how excited I am. David took a job with a Seattle based company (which is the main reason why we were up there last week for his job interview) which means we can settle down and buy a house in the near future! Ever since we moved to Arizona, we've been living a "temporary" life. Everything except our clothes and a couple of toys have been in storage for the last year and a half and I miss my stuff! We are so grateful to my parents for letting us live in their house while they've been on their mission in England. It has been a huge blessing and we are sad to be leaving behind all of my family members who live close by. We've never lived so close to family, since we've had kids, and I have been spoiled by my sisters, brothers-in-law and cousins with all their help! It's been really fun for our children to get to know their cousins and we will miss them! On the flip side, this move to Seattle brings us close to my brother and sister-in-law and their family. As you know, we've visited them a few times in the last couple of years and I've been dying to move there! This is our fifth move in the eight years we've been married. It's been a crazy ride but I can't think of anyone else I'd rather have as my partner. David is patient, smart and hardworking and I'm so grateful to have him as my husband! So, if you're a Seattle-ite, let me know! Let's be friends! :) I'd love to hear your recommendations for things to do, preschools for William (in the Bellevue/Redmond area), must-haves to surviving winter, favorite restaurants and anything else that I might need to know as we move to the Pacific Northwest. Yay!! Let's be friends. I moved here from Texas (the heat!) four years ago and haven't looked back. Best decision I've ever made! PNW is the best. Congratulations! You are a lucky girl, Lizzie!!! Good luck and much happiness in your new location. Ahhh, this is so exciting!!!!! I live in Redmond. You are going to love it here! How exciting!!! I have family that lives in Seattle and I really love the area. Oh that's so exciting and wonderful! Congratulations on the new job and for finally getting your stuff out of storage! I've lived in the Renton area my whole life and love it. There's no better place to live than right here and you already know how many fun things there are to do around here. So happy for you!! Such exciting news. I moved to the Seattle area (a little north of where you will be) a few years ago and I love it. I can't imagine living anywhere else. There are so many fun things to do and it is a great place to raise a family. So happy for your family! Jealous!! LOVE that area! Congratulations!! I have been trying to get out of Utah for-ev-er! I wish my husband would take a job somehwhere- ANYWHERE at this point. OK, not anywhere- but ya know. We did leave Utah once. Guess where we ended up.....ARIZONA! Agh. I had my first kid there- and was in my third trimester in the smack dab middle of summer. So no, don't wanna go back there, but hey, Seattle sounds grand. How fun and exciting for you guys. Best of luck! 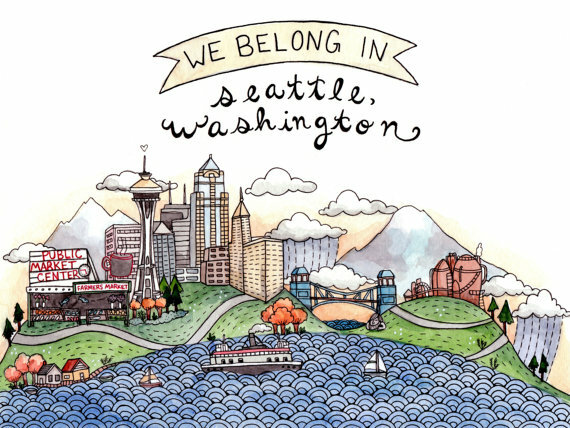 You belong in Seattle! How long have you been dreaming of living there! I will miss you but I'm happy for your new adventure! You're going to LOVE it here. I live in Kirkland, so if you have any questions about the Eastside, I might have an answer! I still can't believe it's real!! I'm stoked you'll be in a "Navy city" because now there's always a chance I'll move to you!!! So happy for your fam!!! Can't wait to see house pics, decorated nursery, your fluffy couch with fluffy pillows!! Love you! I spent some of my childhood in the city of Enumclaw, which is semi-near Seattle/Tacoma. I loved it so much. It was the best time of my childhood for sure. Your kids are going to love growing up in Seattle. I remember we went to the "Black Diamond Bakery" to get pastries and breakfast with my grandparents often. If it's still around, you should try it. Here's a blog I read.... they live in Seattle. You know what one of my biggest recommendations is - get all-weather car mats (rubber). With the rain, it's impossible to keep the carpet ones clean. Hi! i've been following the blog for a while now so, this is so exciting. You're going to LOVE living up here (in my opinion, its the absolute best!)! I first moved here from So Cal in 2004 and then moved away for my husbands job and now we are back and staying here forever :-) I can give you some recommendations on places to go and what not so, if you're interested shoot me an e-mail @ partyoffour@live.com .